When we decided that our bathroom needed some updates we started researching for months to figure out how we wanted to change it up. 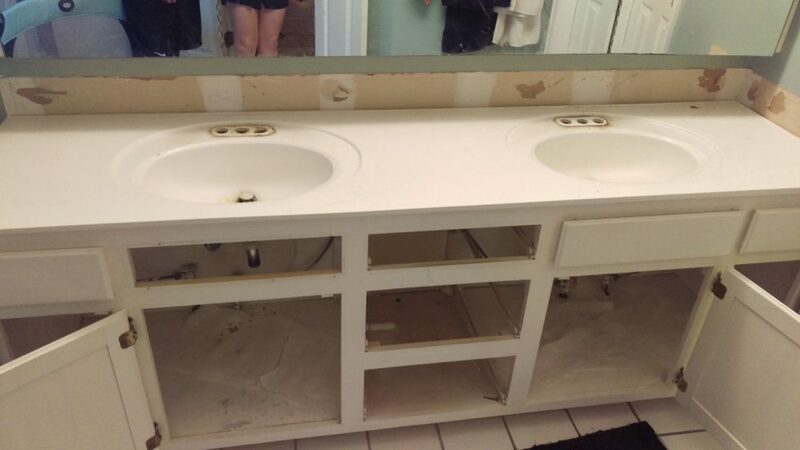 Our previous countertop was outdated and had cracks by the drain that couldn’t be repaired so we decided to start our renovations with a new bathroom vanity. We looked at different materials styles, ideas, pictures, DIY vs. contractors, etc. Finally we found an idea we liked, and we decided to run with it and do it ourselves. 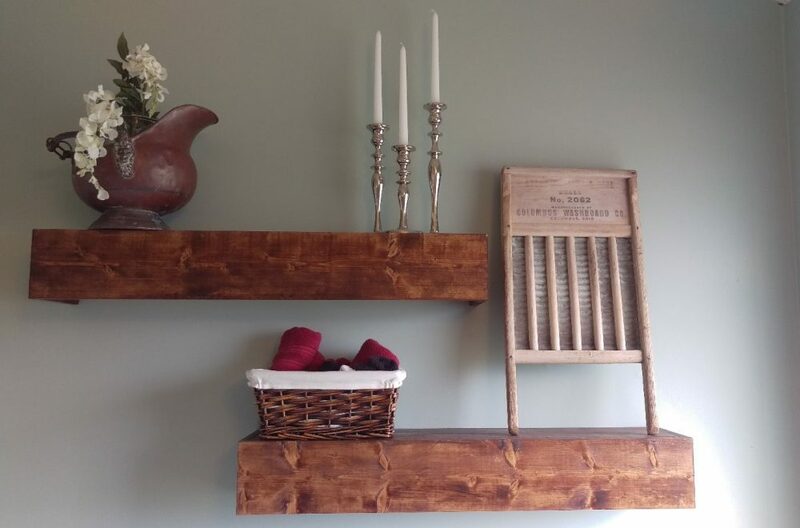 We loved the look of wooden countertops and it matched the floating shelves we had made a few months earlier. 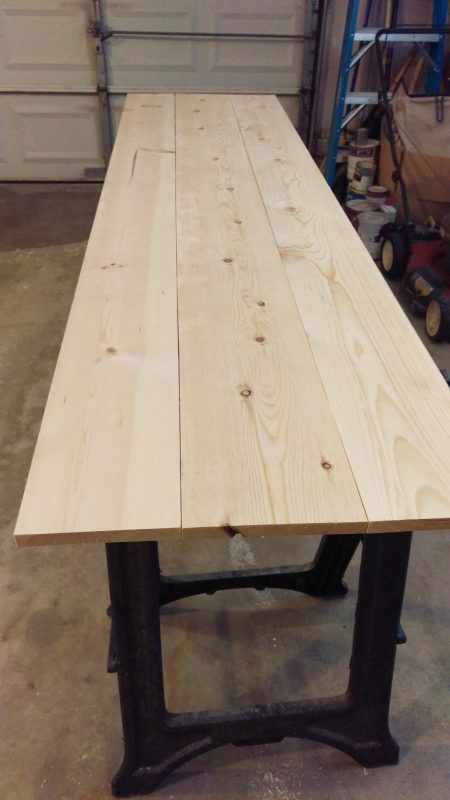 Our previous countertop was 83.5 inches long by 22 inches wide so we needed to replicate that. We started by buying our boards. For this project we used two boards 8 in wide x 8 ft and one 10 in x 8 ft board. Try to find the straightest boards you can (and no, not all boards available are straight). Countertops are typically 22in wide so we needed to shave off about 4 inches. 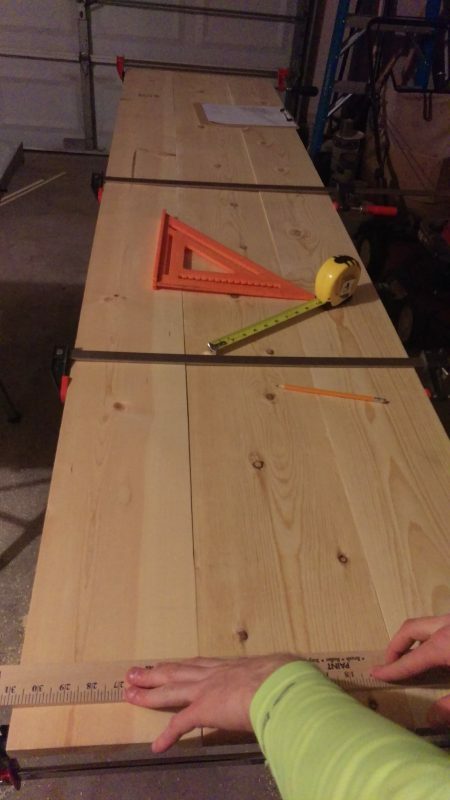 To do this we used our Ryobi Table Saw. The added benefit was that we knew we would have straight, squared edges. 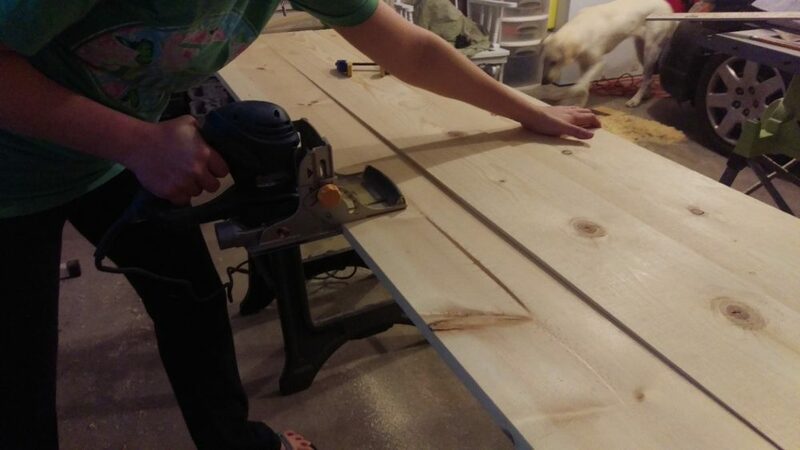 Next, we used a biscuit joiner to join our boards (no I’m not talking about biscuits as in biscuits and gravy, although that would be great too). This tool cuts out slots for biscuits to fit into. You will need to measure to make sure your biscuits will line up on either side of the board. 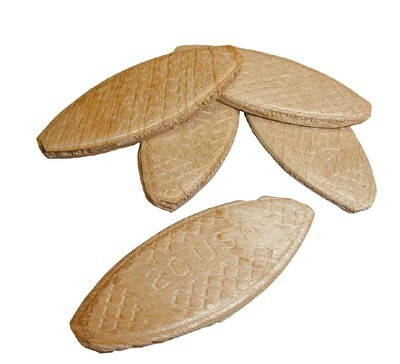 Biscuits will strengthen the bond between boards so I recommend them for any type of countertop or flat wooden surface. After we cut the holes for all the biscuits we put wood glue in the holes and on each edge of the boards being joined. 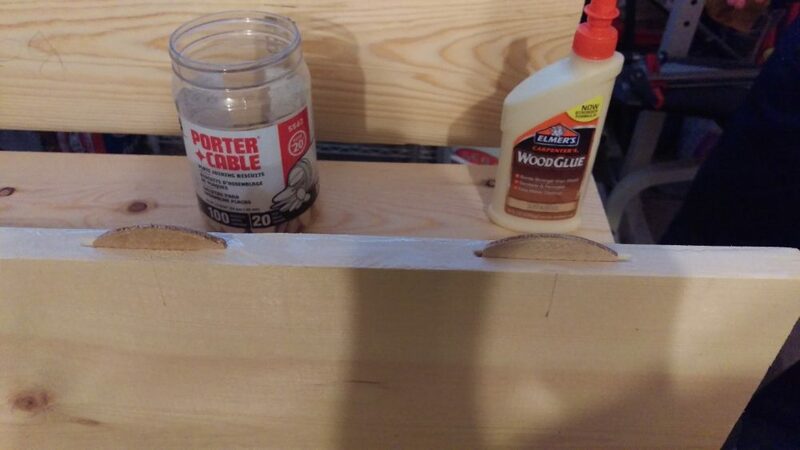 Wood glue is really strong and you don’t need to use a ton of it. Make sure you also put some wood glue on the edges of the wood that don’t have biscuits. You want to place a thin line of glue then take your finger and rub it across the entire surface to spread it out. Wipe up any extra glue with a damp paper towel. Once all this is done push all the boards together. 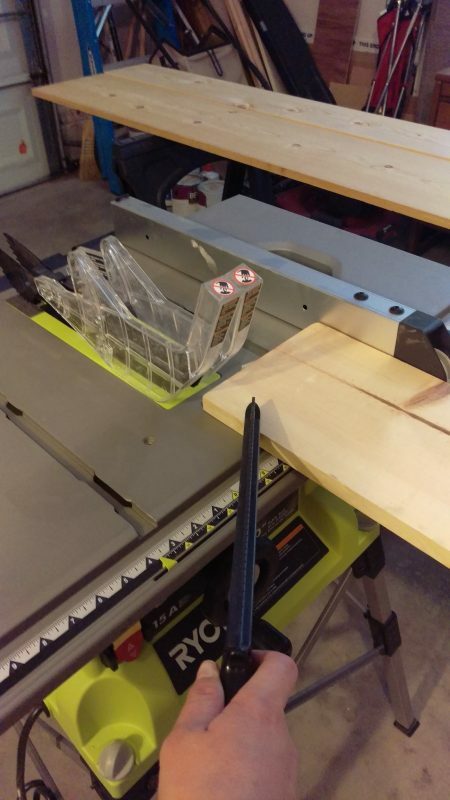 Use clamps to make a tight hold and keep it clamped overnight. Wipe up any glue that comes up through the cracks after clamping. We actually placed our board on the floor with some light weights one top to make sure it was all flat once it was dried. After the glue has dried overnight you should have a flat, strong surface. 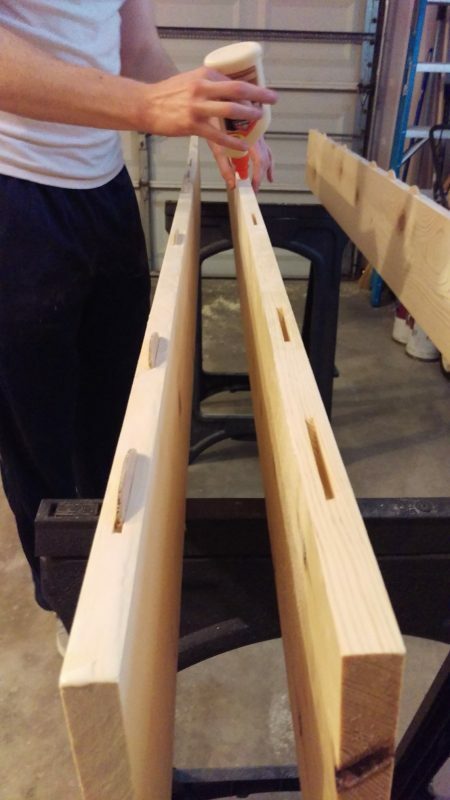 In our case, we left about 1 in extra on each end of the board, then we cut off the extra with a circular saw to get a nice straight edge across the 3 joined boards. There will still be some small cracks in between the boards. Take some wood filler and spread it along the lines. Also cover any knots in the wood so there are no spots where water can accumulate. Let dry overnight. 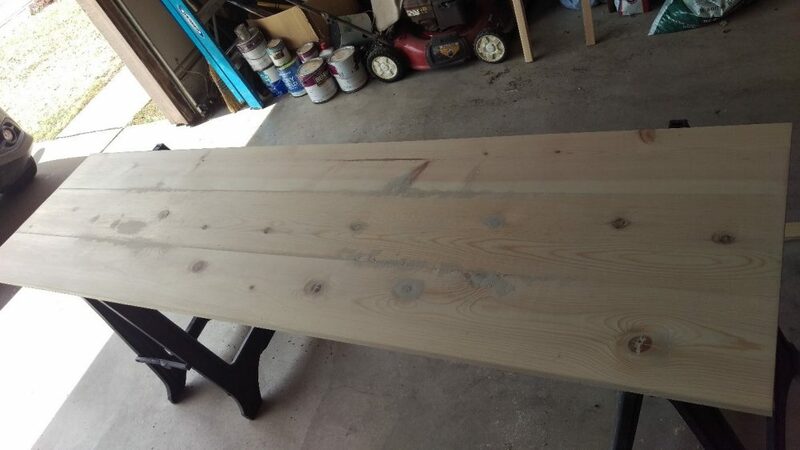 Now you are ready to sand and sand and sand… This will give you a really smooth surface which is what you are trying to get. I started with 100 grit sandpaper with my Ryobi Electric Sander. The sanding will remove any extra wood putty. I did two rounds with 100 grit sandpaper, then switched to 220 grit sandpaper for two rounds. I did one final round of sanding with 400 grit sandpaper by hand. Now we are ready for staining. 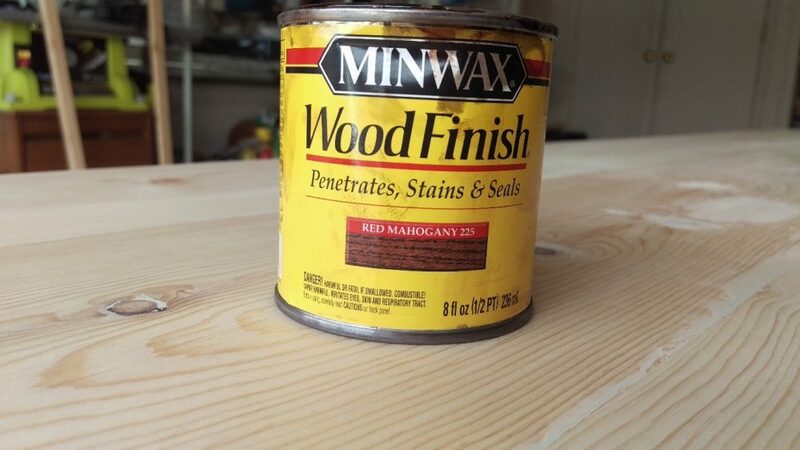 My favorite stain is Minwax Red Mahogany. I use it for almost every project. I applied two coats of stain. Use part of an old shredded t-shirt to apply the stain. Dip a corner of the t-shirt into the stain can and spread that along the board. Make sure that you don’t put too much stain on at once and that you spread it out well. Otherwise you will get uneven coverage. 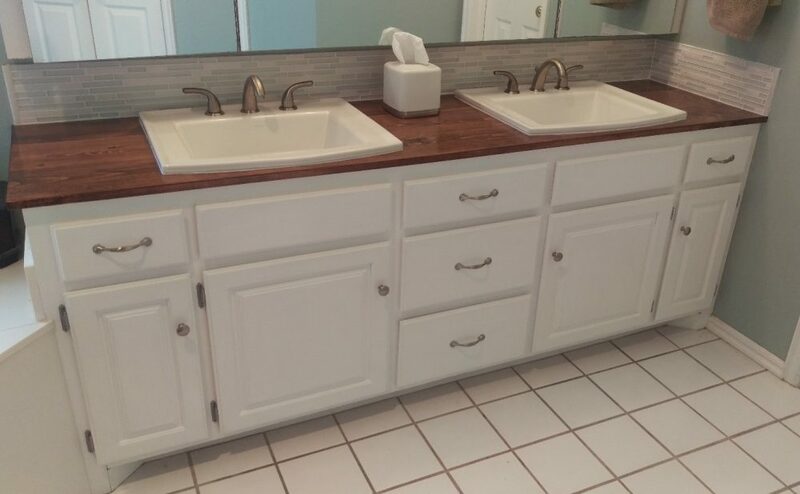 We also already knew where our sinks were going so we didn’t waste time sanding and staining those areas. 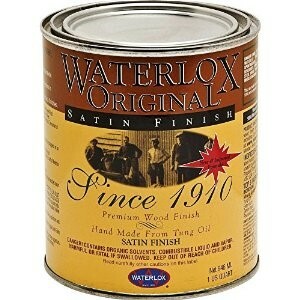 To seal the countertop from water (since this will be in the bathroom) we used Waterlox. Make sure you use this in a well-ventilated area with gloves and eye protection. 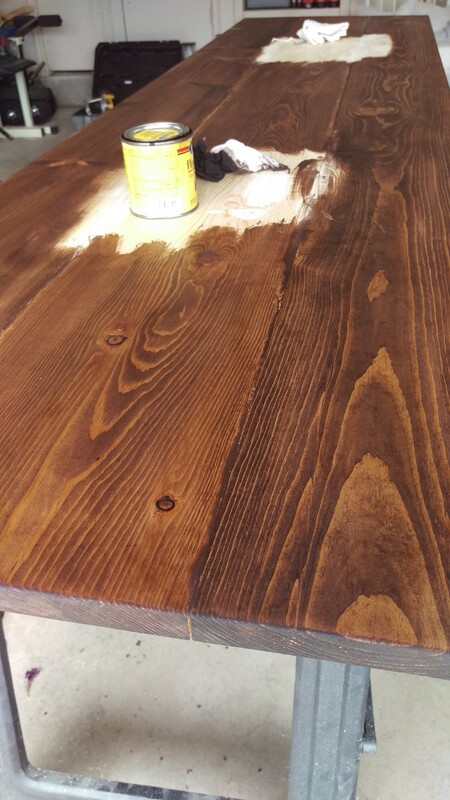 You can only apply one coat a day so this process takes a week, but it provides a great finish. I did 5 coats of Waterlox. 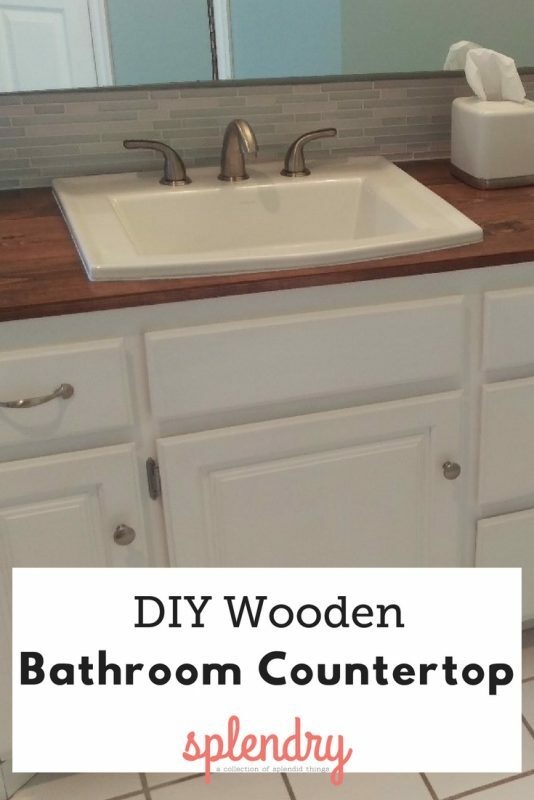 Your countertop is almost done! 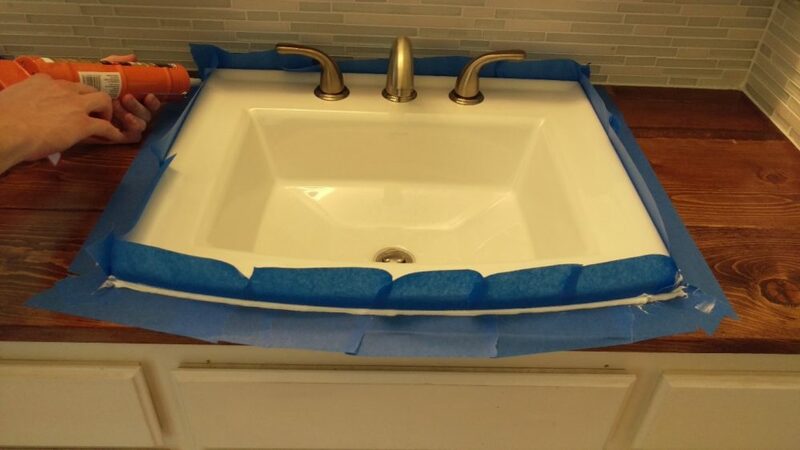 Now it’s time to cut the holes for your sink, and you’re ready to start the install! 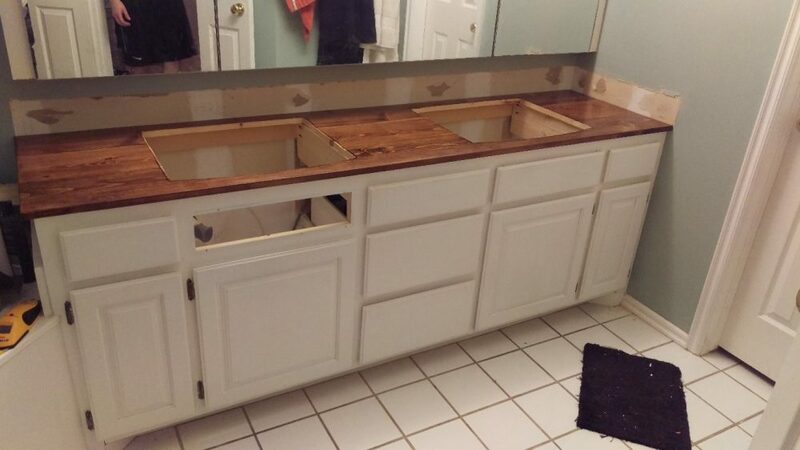 To remove our old countertop I started by removing the side splash and back splash first. 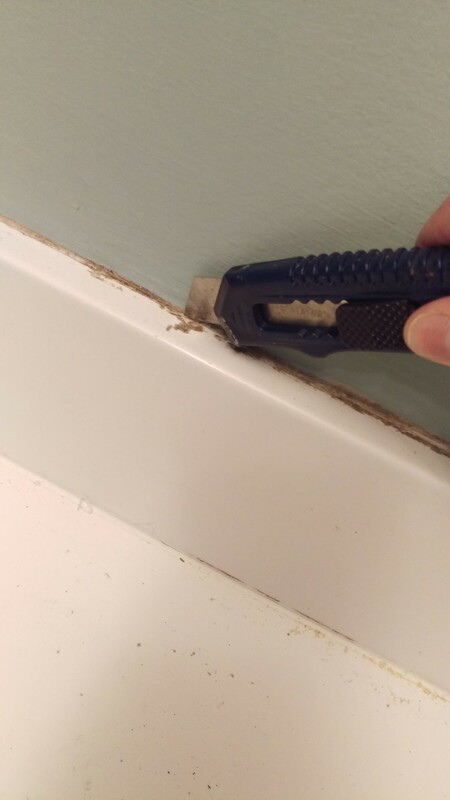 I took a knife and cut the old caulk to loosen it from the wall. This took a little work to loosen all the caulk but I was eventually able to pull the backsplash and side splash off. 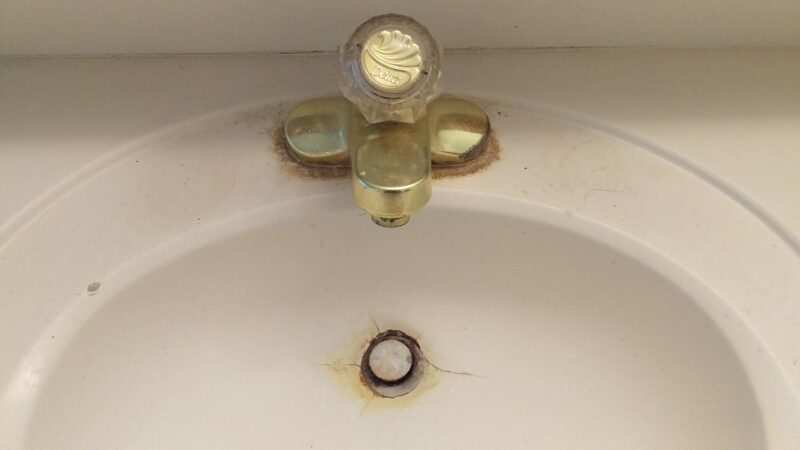 Next we removed the faucets. 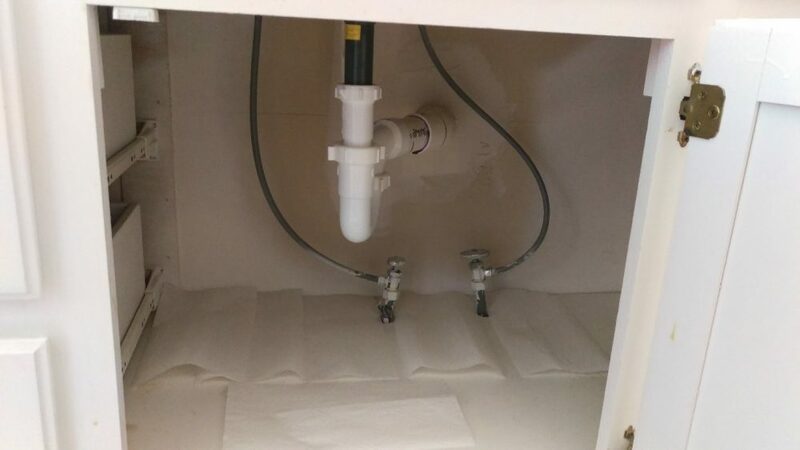 To do this unscrew them from the hoses underneath the sink and then pull them out. To remove the sink and countertops we had to unhook the pipe and the drains. 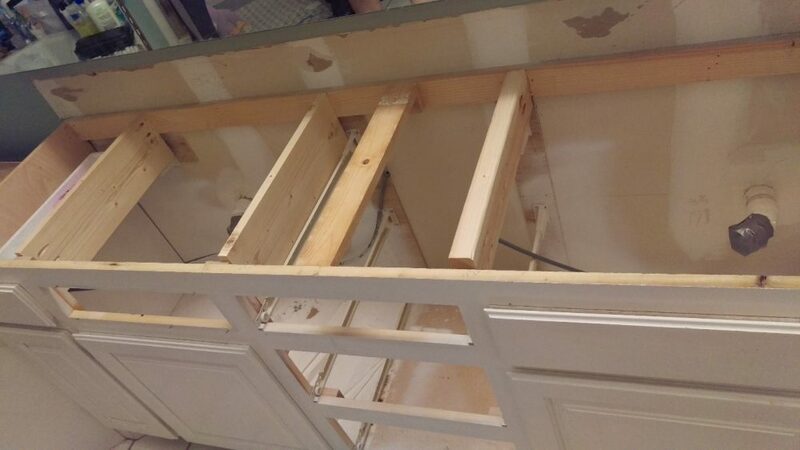 Then we were able to just lift the sink up from the cabinets. Because we had drop in sinks for our new countertop the weight was not going to be evenly spread out on the countertop. 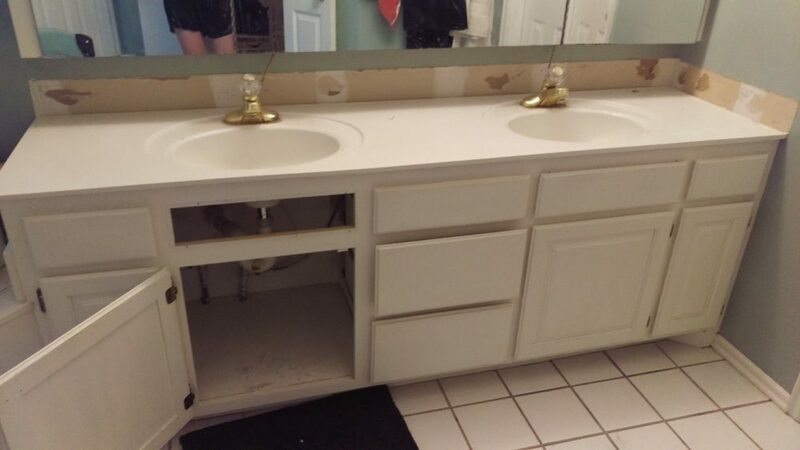 We needed to reinforce the part where the sinks would be. 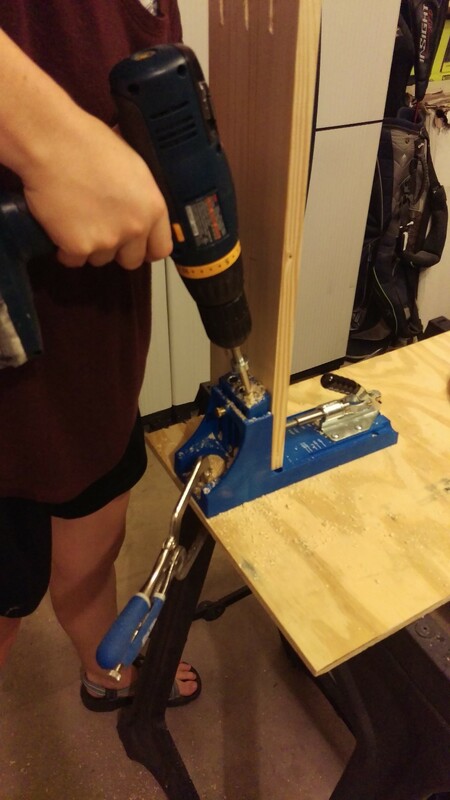 We prepared the boards for installation using my favorite tool – the Kreg Jig. 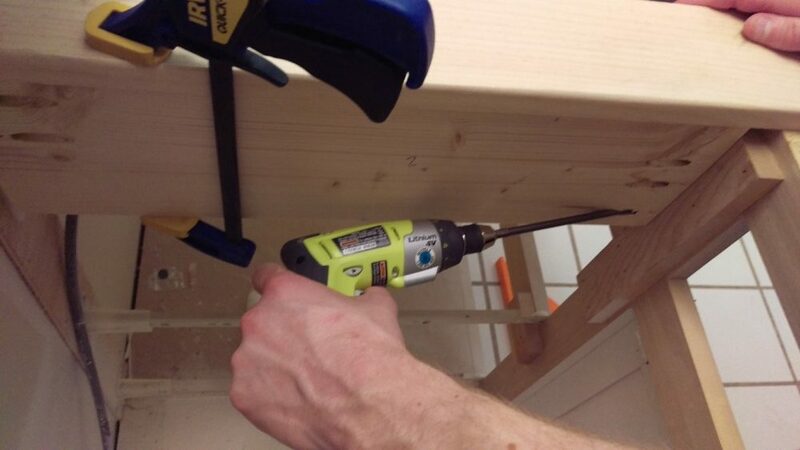 The Kreg Jig makes it easy to attach pieces of wood and hide the screws by creating pocket holes. You screw the pieces together through the pocket holes. It really makes certain projects much faster. 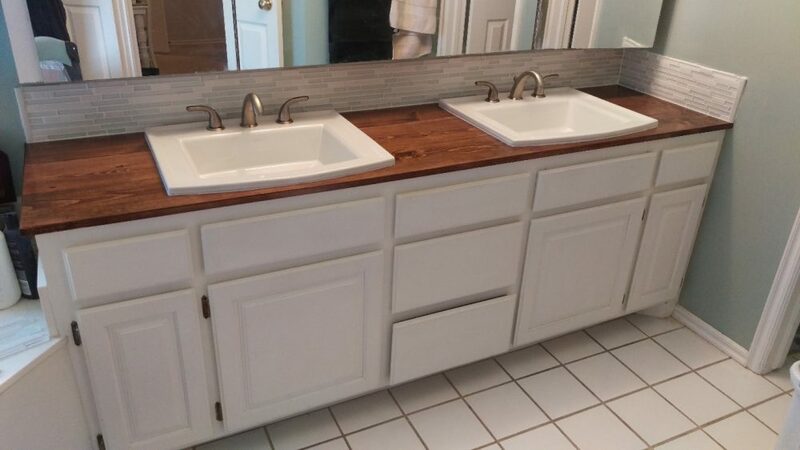 We installed 4 additional boards to add support for our sinks. Now we were ready to place our countertop. Once again wood glue comes in handy. 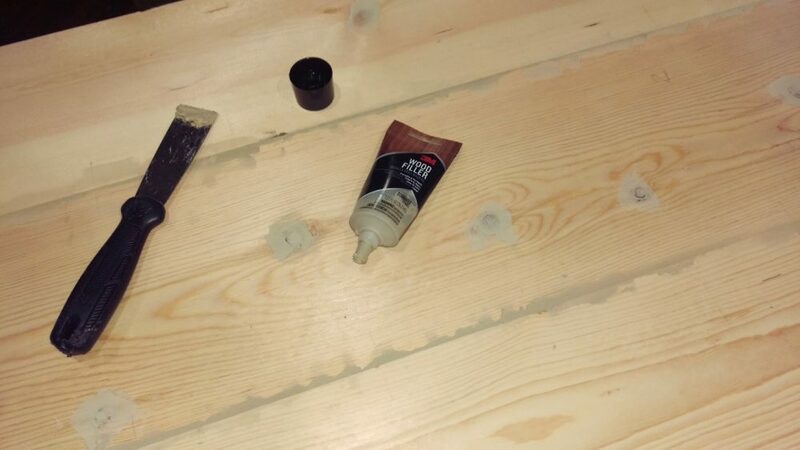 In this case, you don’t need to cover every surface with wood glue, just a couple places on all sides. Now it’s time to place the new countertop. 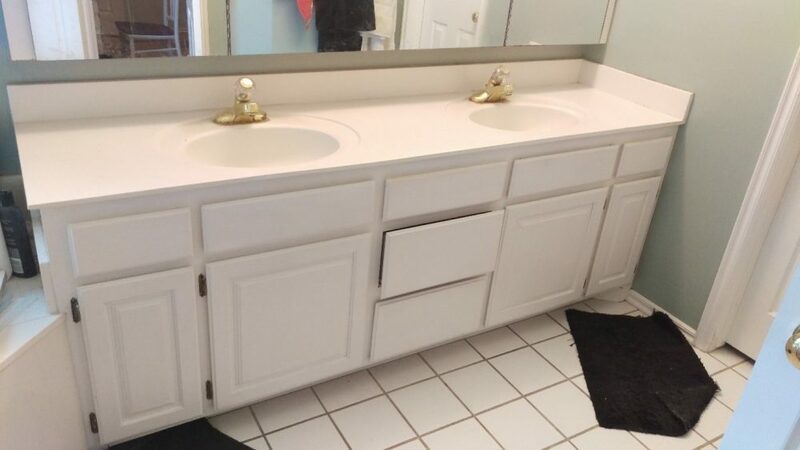 Now you are ready to install the sinks. 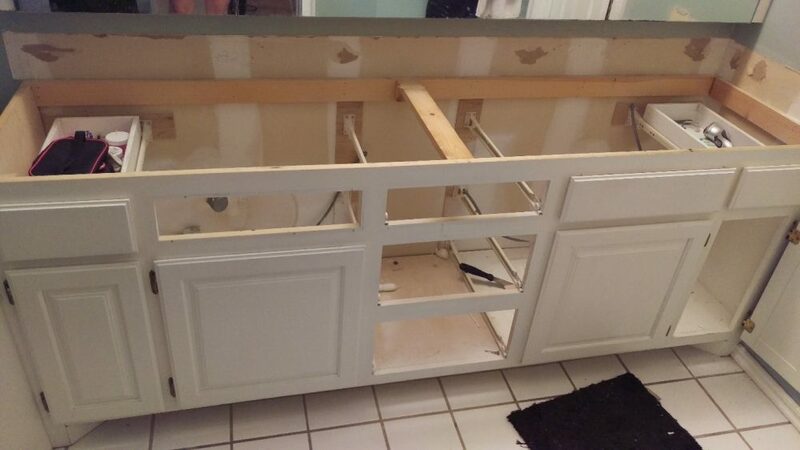 We bought our Kohler sinks off of Amazon and loved that they had a wide base. We then hooked up the faucets. The drain in the sink was in a different location than the old one so my husband had to reconfigure the pipes. I won’t attempt to explain what all he did on here since I don’t really understand that part :). We needed to seal the edges of the sink and the counter to the wall. Tape off either edge of where you are sealing then do a thin line of silicone caulk. Stick your finger in soapy water and run along the caulk. 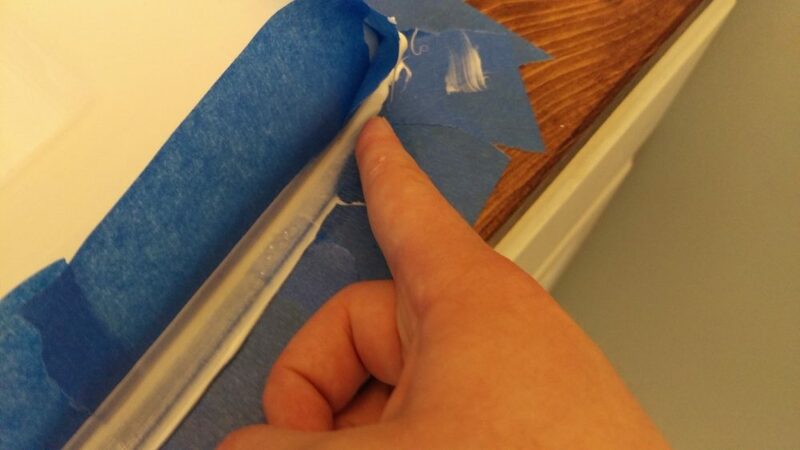 Immediately remove the tape from where you were caulking and let the caulk completely dry. We were almost done! We applied a new coat of white paint on all the cabinets and drawers. They were chipped from years of wear. This was a quick project that added a great clean finish. Lastly we put on knobs and pulls to the drawers and cabinets and sat back and enjoyed our work. We loved how it turned out and loved even more all the money we saved! 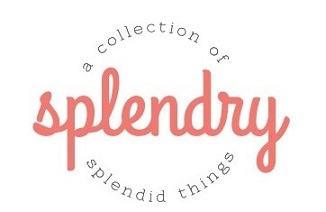 Let me know if you have any questions on your project and I will try to help! 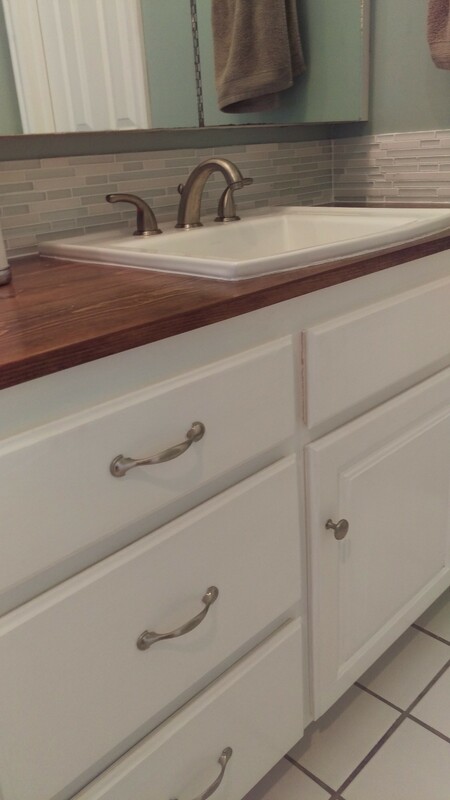 (And if you want to see the process to adding that tile backsplash, head here! i wonder if you can do this to a bathroom floor – what do you think? 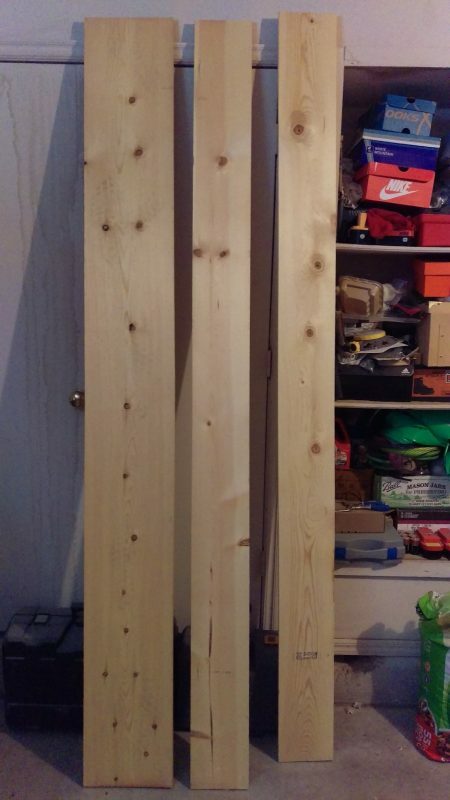 How thick are you boards? The boards we used were 3/4 inch thick! Let me know if you have any other questions!!! What a gorgeous outcome! Your hard work really paid off here! I will be remodeling our bathrooms in the very near future, and this idea is wonderful. Also, that tip about taping off where the silicone goes is BRILLIANT!!! That will definitely be used often!!! It looks stunning!!! Great job with your project! And you did an amazing job explaining each step. I love having wood elements in the home.